I’m just wondering if any of you have upgraded your chassis/subframe to help compensate for motor/horsepower increases. If so, how did you do it and do you have any pics you can share. I have some ideas but would love to see what others have done. Read the full post and it was very interesting and informative but don’t see that it addresses strengthening the chassis/subframe. Hoping to do make any chassis upgrades prior to building the motor and trani mounts. it all starts at the wheels. 5 bolt conversion, big brakes, bigger diff...... if you cant get the power down there is no point. notice how he didn't have to notch the strut tower to fit the coil overs and camber plates. Aside from the usual added seam welds, some will gusset/triangulate the upper box section under the front fenders to the vertical section of the lower A pillar. Those retaining the stock type recirc ball steering boxes will often gusset both sides of that frame rail when running sticky tires on road courses or Solo II action. Bottom line, the 510 chassis is just plain tough out of the box. It is overbuilt for the grocery getting it was designed for, and the reason why it was such a popular rally car for so many years past it’s production - like for two decades of competitive rallying here in the PNW. It wasn’t until the Subaru’s came along that the 510 finally got pushed off the podium. That’s pretty amazing, it a true testament to the strength of the chassis design. Tell us what your planning and why you think the car needs to be so much stronger? I figured I'd chime in here a bit as well because I have done some research into the subject apart from the R200 etc. mentioned above. 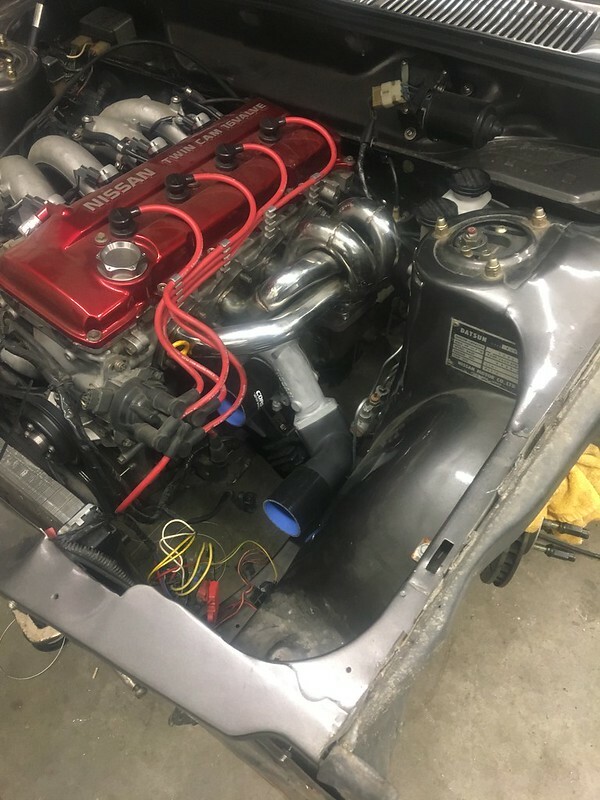 There's this thread that comes to mind: http://www.the510realm.com/viewtopic.ph ... ng#p155620 and I've heard from other references that their 510s twist with big power and the doors don't close quite like they used to (think KA-T etc.). -Byron's triangular braces on the inner fender to A pillar is on my list. Common mod on a lot of old cars. -Triangulated front strut tower brace. Guys like the Matt (Ecotec510) claim this has stiffened up the front end plus it's a good fab project. -Braced rear shock towers into the parcel tray area. I saw a post on Datsport about this a long time ago. I can't get to their site right now since it is down for maintenance. I read a bit about structural foams tonight. Perhaps they'd be a suitable option for a dry location like the lower C pillar zone by the rear parcel tray?? Hard to make a definite conclusion amid the internet conjecture. It's pretty clear that the SAE papers state that structural adhesive in highly stressed zones of vehicles increases modal frequency (read: stiffness). Whether it would provide worthwhile benefits on an old chassis where you'd struggle to get good adhesion is anyone's guess. Isn't there an issue with some torque twisting around the rear shelf/gas tank area? Also, some rumor regarding joining the front and rear subframes underneath the car. Weld in a channel under floor. Z car owners do it. Thanks for chiming in Guy’s. I appreciate it. I’m building my first 510 and it will be for my wife. This is by far not my first time building a vehicle but have never played with Datsun before. It is a 1971 4 door 510. We just recently sold her 1982 Corvette and this will be her replacement. It may or may not be her daily driver. That is yet to be determined. She has a Jeep Liberty as her daily. When she said she was ready to sell her Vette after 10 years of enjoyment, I asked her what she would like to replace it with. She told me a Datsun 510. I had no idea she liked them and we’ve been married 35 years. She has some health issues, MS being one of them. This leaves her left side weaker. Her 3 request for the build was that she wanted a 4 door since she has a service dog, for ease of getting the dog and future car seats for grandkids into the back. That it have plenty of power and be an automatic due to the MS. I purchased a wrecked 2003 Supercharged Nissan Exterra as a donor vehicle. I’ve taken the seats, center console and even the carpet from it and installed them in the 510. The speaker system has also been remove for future use. 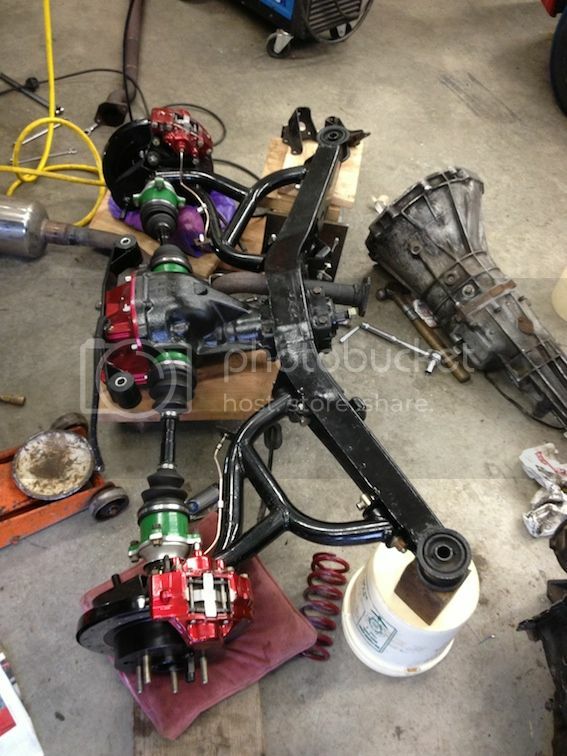 The front suspension has been upgraded to 280zx with new drilled and slotted rotors and ss braided flex lines. If I remember correctly it has a 1” track bar. The rear suspension has new coils spring for Dodge Dakota pick up, Maxima disc brake conversion also with drilled and slotted rotors and ss braided flex lines. The rear is running a 3/4” track bar. Both front and rear have new KYB struts. I would like to change to coil overs at some point down the road. I would like to upgrade the stock differential from the open 160 to something better and posi but haven’t found one yet. Last week a buddy and I placed the motor and trani into the vehicle and I’ve got it positioned where I want it. 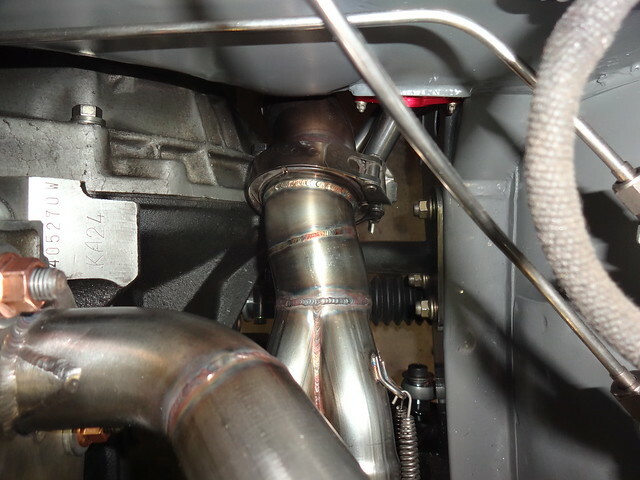 I was thinking about running some 1”x3” 1/8” wall box tubing from the front subframe to the rear and connecting it to the rear subframe. My thought was that this would also give me a solid anchoring point for the new trani crossmember and help make the chassis stronger. I plan on installing front and rear strut tower bracing also. As stated, the car will possibly be her daily driver but will also see some track time at the autocross. Not that I expect her to be winning, but be able to safely have fun out there. I’m definitely one of the lucky ones and married a car gal. She allowed me to build the corvette of my dreams (a 1970 all tube chassis car with a small block 427 putting out 603hp coupled to a t56 magnum 6 speed trani. It’s running on 1993 ZR1 suspension and dual adjustable coil overs) so I want to return the favor in her Datsun. I will check out the other links you guys have posted and look forward to your input. I forgot to mention that your workmanship and build is impressive Jordan. Great work. When I cleaned up my engine bay/front suspension I found some cracks in the frame rails where they attach to the firewall. I attribute this to running stiff suspension and sticky tires for many years. To alleviate this I built some gussets for this area. I'm not sure if there would be enough clearance for this with the stock steering box. I haven't seen people reinforce this area so I thought I would throw it out there as an idea. You can see the gusset in this picture. Duke, The 68 is the only year they had a weld where you added the gusset, the rest of the 510's didn't, interesting yours cracked. Whoever thought it was a good idea on the 68 seems to have been right. I can throw another thought out there regarding strut tower braces. I have parted many 510's over the years. Rust on cars that were used in salt ravaged them pretty well. On car in particular had the upper box sections under the top of the fenders nearly rusted right off, with holes at the base of each strut tower. I placed a come-a-long between the towers and figured I could collapse the front end and pull the strut towers of this incredibly rusty car right together. To my surprise, I didn't get them to move more than 1/8". I could hear the cable on that come-a-long cracking and staining under the load, yet I got nowhere on collapsing the front end of this car. So, my thoughts on strut bars in this particular car... I really don't feel they are necessary. And of course there is no such thing as a rear strut bar. You could tie the shock towers together, but they do not do much as the spring load goes into the floor pan right at the rear seat belt mounts, tied to the quarters and across the car by the rear seat brace. As far as frame connectors front to rear... I'm not sure where you'd connect them to the rear. You could run a "rail" under the floor, but if you look at the floor pan, the rear X member mounts to a stud protruding down from the rear seat area. The only way I have effectively tied these areas together is with a full cage. It's effective, but in my wiser years, I no longer advocate roll cages in street cars where any part of a cage can be in contact with the drivers or passengers bodies - especially the head area. Let's just say I've observed some things regarding this over the years that make me second guess what we were all building in our more youthful years. Coming back to the rear X member. Later Nissan product used a second bracket from the bottom of the X member mounting studs to the body - taking the mounting point out of single sheer and making it double sheer - which from an engineering point of view is always much better. 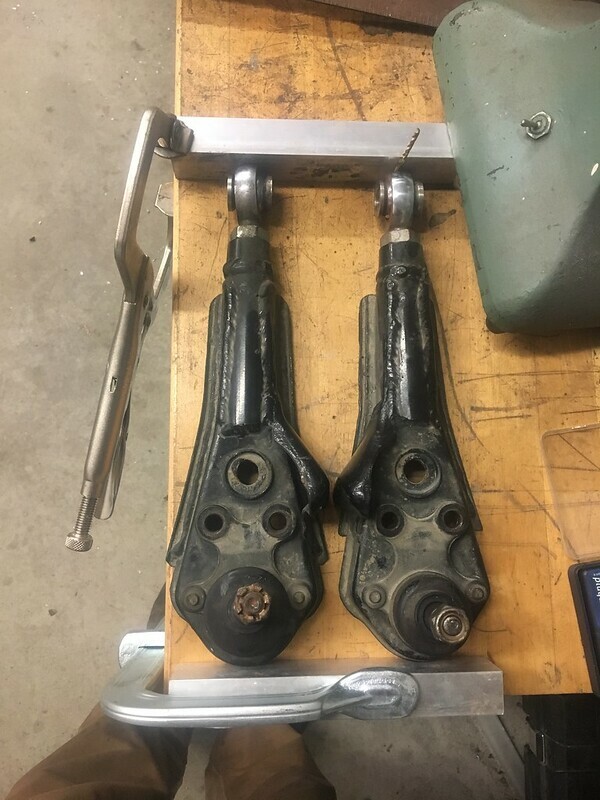 but having said this, I can not imagine the pounding that the rear suspension in my rally cars took - I ripped entire rear lower control arm off, yet never,ever saw a damaged or bent single sheer outer mounting bolt.... Again time proved that this worked pretty well, all things considered. Now that we know your building a VG powered car, honesty the 510 chassis doesn't need much. There have been many VG powered (even turbo) cars on the track with good rubber that have not exhibited any structural deficiencies of note. I agree that VG can produce 3x the power and torque of the original L16, but many have been built and tested very well over the years. Really, you won't need to go crazy here at all. In fact a little seam welding, and the gussets under from the upper front box member to the mid A pillar seem to be a good idea - and you'll be good to go. The frame connectors I can't see helping you much. The roof section does this for you. My experience is that the tunnel does add some rigidity, as do the rocker sections, but the floor section is pretty much along for the ride and the "frame rail" beyond the fire wall does little except hold that really thin floor section up under your feet! It doesn't even tie into the trans mount, nor is there a need for it to do so. A few more thoughts for you. This is actually a good discussion, and I hope more chime in with thier thoughts as a general open topic. Thank you for your input. As I stated, I’m new to the Datsun world and appreciate the wisdom of others who are more familiar with them. ....probably because it is tough... but thats not the common thought. there are things 510 owners face when out in public with their cars and I try to bite my tongue when faced with them. for example monthly I hear the same joke from complete strangers: "hey do you know how they came up with the name Datsun ?" or when someone says they rust real bad... those things were made out of pop cans... if you strip them down you can see coca cola... but im always thinking... Wrong! the sheet metal is thicker than that road runner. the supports and stiffeners are thicker than the metal on the army truck. as for the rust.. most people cant wash a car, brake fluid needs to be removed with alcohol and you never put away a salty car in a warm garage. some scaffolding in the trunk was the fix. 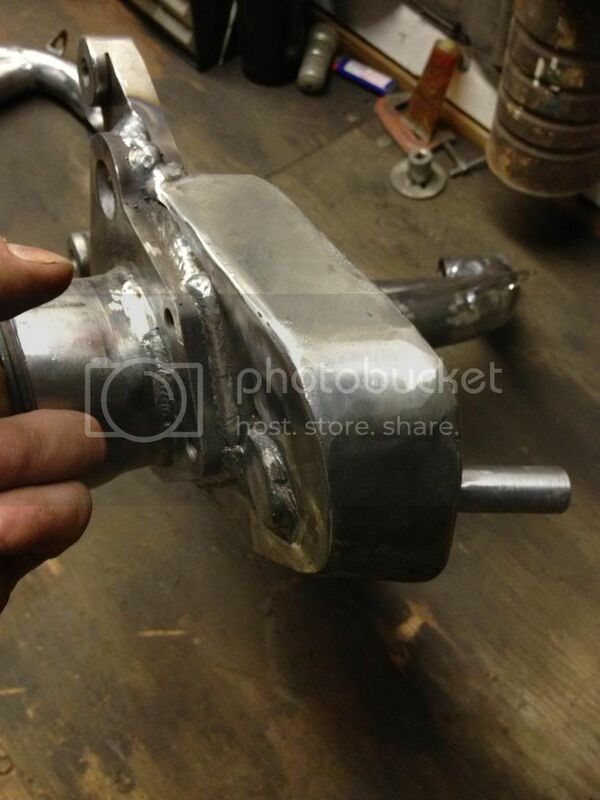 Only thing we did on my car was to make a "doubler" plate for the rear control arms, as they are quite weak. As Byron said, we tested like he did across the engine bay and it hardly moves at all, so even on Collin's NASPORT 510 the bay was left open. My car does flex in the door openings when it is jacked up, but, I just never worried about it. So much moves around with the tires that I would never say I noticed anything as a driver. I have kept an eye on my frame and attachment points and have never found a crack or anything after being built in 1978 and went through some serious combat years, virtually 24, plus all the canyon carving.